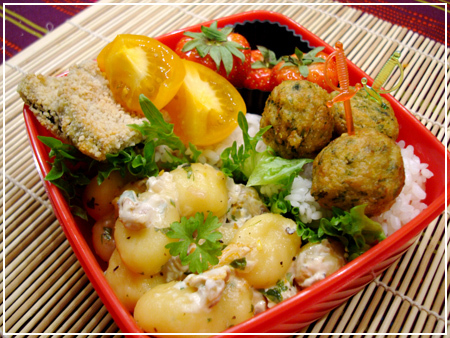 Homemade potato salad garnished with red onion, crisp lettuce and a baby plum tomato in the smaller box. 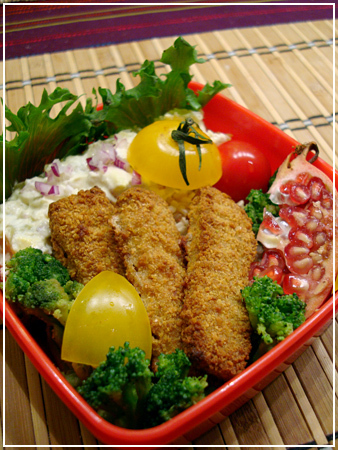 Wholewheat-breaded fishsticks on brown rice, a yellow tomato slice, broccoli tossed in sesame oil and a slice of pomegrenade in the bigger box. 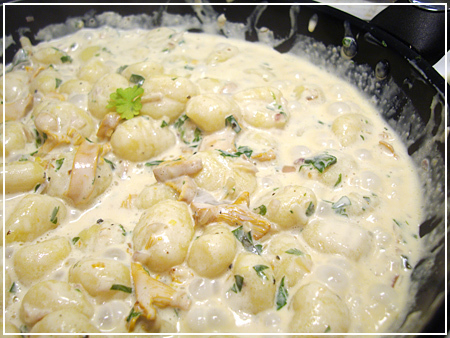 OK, when I said I was going to post a complete recipe I lied – I still haven’t gotten over my respect for making gnocchi myself, so those are of the storebought “fresh” variant. But the final dish is so infused with the delicious flavour of chanterelles I didn’t want to keep it from you! 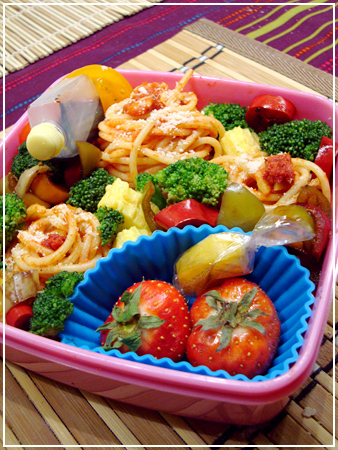 It’s just to my taste – simple and lazy, but with a fantastic final result. 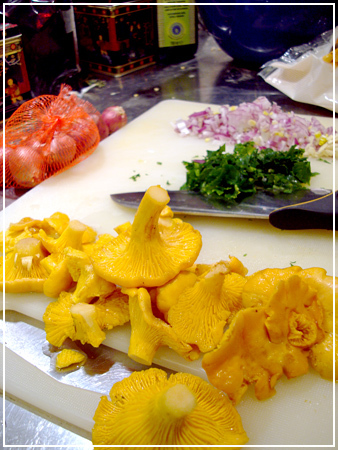 Here are the mushrooms in their glorious yellow goodness. I cleaned them – you shouldn’t really clean mushrooms under running water, but those were full of moss and pine needles and associated things, and needed to be cleaned. Since I was going to use them immediately, I didn’t bother about it too much. There’s also a red onion, already chopped, a clove of garlic and about half a cup of chopped parsley. I started by frying the onion and garlic in some chili oil (you can also use butter) until it was soft and translucent. Taking some time seems to really be worth a lot in this dish – I am usually all about getting things done quick but the flavour gets better here if you really get everything timed correctly. 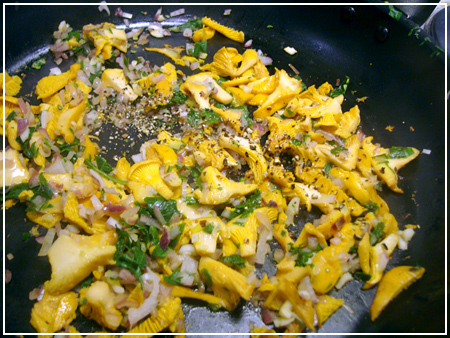 The next step was to fry the parsley a little, and then add the chanterelles, salt and pepper. At this point, I started to warm the lazy gnocchi: I emptied the bag into a sieve, hung the sieve in a pot on the warm stove, and poured boiling water on it, leaving them to steam for another minute. I also added 1/2-1 cup of cream to the pan to infuse it with the mushroom taste. 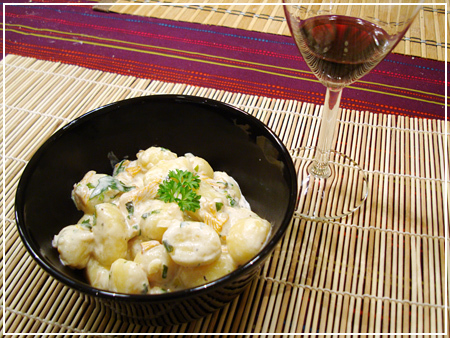 I love gnocchi for their ability to really soak up sauces and flavours, much better than pasta. Therefore, just pouring the sauce over them would be wrong. They have to go in the pan and finish cooking with the sauce! Since they’re pre-made it takes about 2 more minutes, just enough to set the table and pour the wine. Perfect! 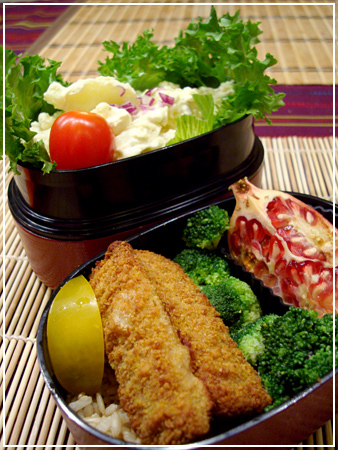 This bento is another collection of weekend leftovers. The protein ratio is way off, but I really didn’t feel like more falafel, so this will have to do. Top (big layer): Gnocchi with chantarelle mushroom sauce, rice decorated with a bell pepper on a lettuce leaf. 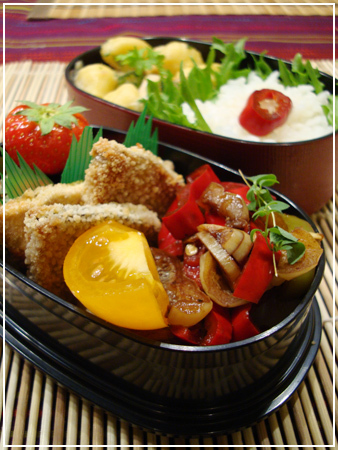 Bottom (small layer): Strawberries, breaded ovenbaked eggplant, fried marinated bell pepper on top of baked potato cubes, organic tomato wedge. The BF gets the same but with some extra falafel (because he asked for them!). A mixed box of mostly freezer-stash staples. 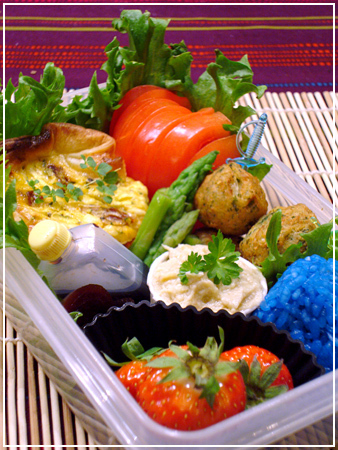 Starting in the back, a mini feta/tomato quiche, half an organic tomato in slices, some mini falafel, asparagus spears, a bottle of balsamic vinegar for the tomato/lettuce, some pickled onions (the purple stuff under the bottle), a paper cup with baba ganoush, a blue onigiri and strawberries dipped in chocolate. It may be mostly from the freezer but it’s all yummy! I’m almost at the bottom of my blue onigiri freezer stash now. I’ll have to make more sometime. Indigo is one of my favourite colours! Top (small box): Couscous salad with parsley and mint (technically Tabbouleh with the couscous ratio cranked way up), two dates and a tiny radish. 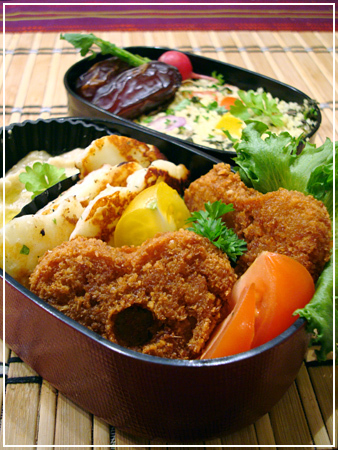 Bottom (big box): Heart-shaped falafel on lettuce, organic tomato wedges, grilled Halloumi, Baba Ganoush with olive oil in a muffin cup. 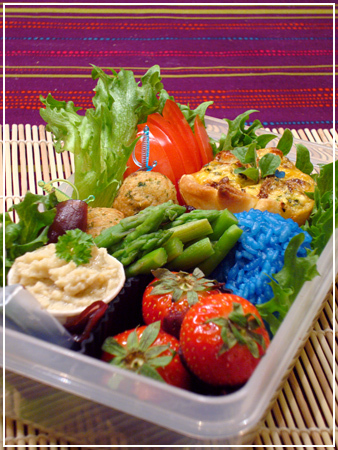 The falafel are restaurant leftovers – I thought they were perfect for bento! BF gets the same in a square HK box. 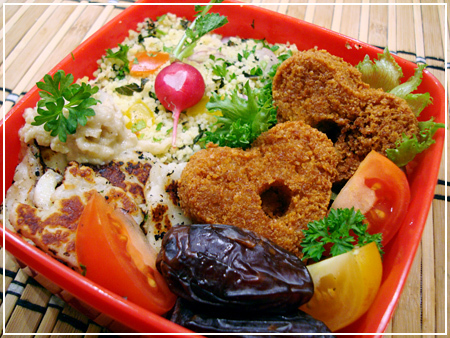 His radish has a little heart cutout and the falafel show off their heart shape a lot better than in my box. I’m not happy with the box anyway. The colours kind of run together on the left side, everything is beige. Meh! I should have separated it better. Mix butter, sugar and almonds well. Add in the eggs one by one and whip. Mix the dry ingredients (flours, baking powder and vanilla sugar) and mix just to combine. Add milk as necessary. 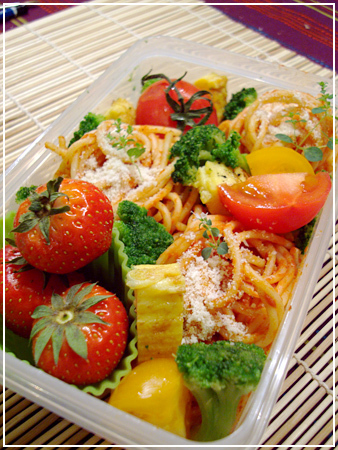 Line a 6pc. muffin tin with butter and almond shaves. 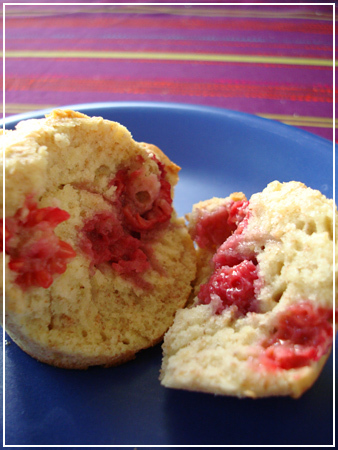 Carefully mix the raspberries into the dough using a spoon and spoon the dough into the tins. Bake at 200 deg C for 15-20 minutes, cool covered with a towel.